Virunga National Park is unique with its active chain of volcanoes and rich diversity of habitats that surpass those of any other African park. Its range contains an amalgamation of steppes, savannas and plains, marshlands, low altitude and afro-montane forest belts to unique afro-alpine vegetation and permanent glaciers and snow on Monts Rwenzori whose peaks culminate in 5000 m height. The property includes the spectacular massifs of Rwenzori and Virunga Mountains containing the two most active volcanoes of Africa. The wide diversity of habitats produces exceptional biodiversity, notably endemic species and rare and globally threatened species such as the mountain gorilla. Due to its variations in altitude (from 680 m to 5,109 m), rainfall and nature of the ground, Virunga National Park possesses a very wide diversity of plants and habitats, making it the top African National Park for biological diversity. More than 2,000 premier plant species have been identified, of which 10% are endemic to the Albertine Rift. The afro-montane forests represent about 15% of the vegetation. The Rift Albertine also contains more endemic vertebrate species than any other region of the African continent and the Park possesses numerous examples of them. The Park contains 218 mammal species, 706 bird species, 109 reptile species and 78 amphibian species. It also serves as refuge to 22 primate species of which three are the great ape – mountain gorilla (Gorilla beringei beringei), the eastern plain gorilla (Gorilla beringei graueri) and the eastern chimpanzee (Pan troglodytes schweinfurthi), with a third of the world population of mountain gorillas. The savannah zones of the Park contain a diverse population of ungulates and the density of biomass of wildlife is one of the highest on the earth Planet (27.6 ton/km2). Among the ungulates, there are certain rare animals such as the okapi (Okapi johnstoni), endemic to the Democratic Republic of the Congo, and the red forest duiker (Cephalophus rubidus), endemic to Monts Rwenzori. The Park also comprises important tropical zones essential for the wintering of Palearctic avifauna. The Park is characterized by a mosaic of extraordinary habitats that extend over 790,000 ha. The property is clearly delineated by the 1954 Ordinance. The wealth is well protected despite the economic and demographic challenges to its periphery. 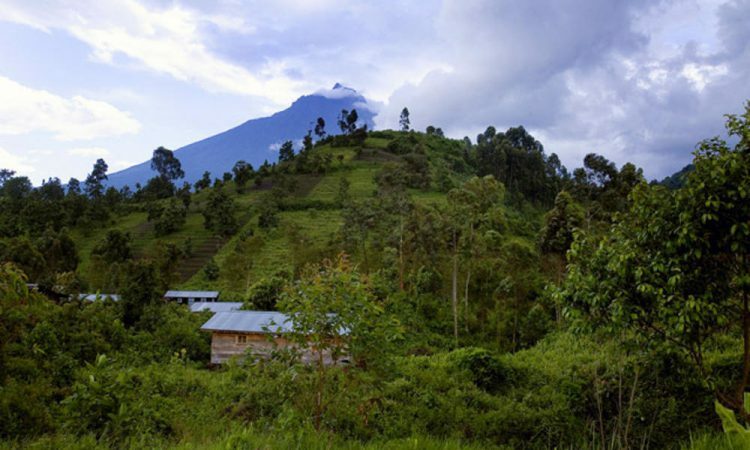 The Park contains two highly important ecological corridors as it connects the different respective sectors: the Muaro corridor connects the Mikeno sector to the Nyamulagira sector; the west side connects the north sector to the centre sector of the Virunga massif. The presence of the Queen Elizabeth National Park, a protected area contiguous with Uganda, also constitutes an ecological land corridor connecting the center and north sectors. Also, Lake Edward forms an important aquatic corridor. The property has benefited from the status of National Park since 1925. Its management authority is the Congolese Institute for Nature Conservation (ICCN) the body which has lost numerous agents killed on active service. The Park encounters management problems. To assure the perpetuation in resource values of the property, the Park must be managed on a scientific basis and possess a management plan which will facilitate, among others, a better delineation of the different zones. Strengthened surveillance is required to assure the integrity of the Park boundaries. It would reduce poaching, deforestation, and pressure on the fishery resources (which risk increase), notably activities by isolated armed groups. To this end, the strengthening of staff and availability of equipment as well as the training of Park staff are of primary importance. Improvement and strengthening of the administrative and surveillance infrastructures would contribute towards reducing the pressure on the rare and threatened species, such as the mountain gorilla, elephants, hippopotamuses and chimpanzees. In view of the important increase in the populations, the establishment of buffer zones in all the sectors is indispensable and a matter of urgency. Another priority is to establish a Trust Fund to guarantee sufficient resources for the long-term protection and management of the property. The promotion of a localized and controlled tourism could increase the income and contribute towards regular financing for the maintenance of the property.